'Shimla' (Barry Blyth, R. 2010) Seedling #R3-4. IB, 18" (46 cm), Late midseason bloom. Standards buff apricot, light violet infusion toward center; falls soft creamy-apricot, white area around tangerine beards, many lavender-pink dots on outer edges, very ruffled to laced. 'Pink Frosting' X 'Dark Drama'. Tempo Two 2010/11. 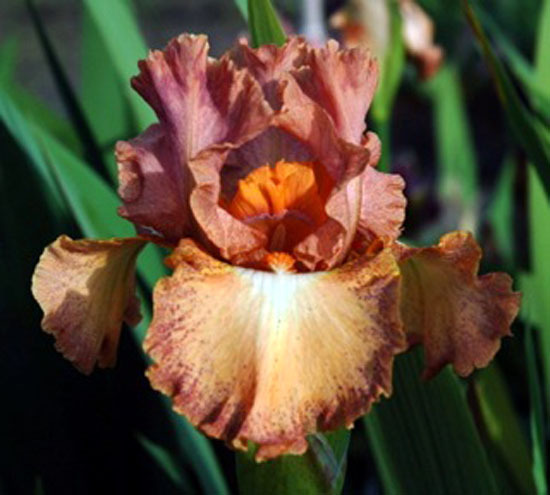 Hybridizer's Comment: Standards are buff apricot with a light violet infusion around midribs. Falls are soft creamy-apricot with a large white area around beards. Around the falls is a band of lavender pink dots, no stitching. Beards are tangerine. The flower is very ruffled to near lace.